Founded in 1980 by well-respected Spanish cheesemaker Josep Cuixart, Formatges Can Pujol currently resides in the village of Vilassar de Dalt, north of Barcelona in Cataluña, Spain. The farmstead dairy still uses the milk from their own goat herds, but also supplements with fresh milk from local farmers. Featured in this month’s assortment, Ombra, known locally as Ros, was created in 1993. 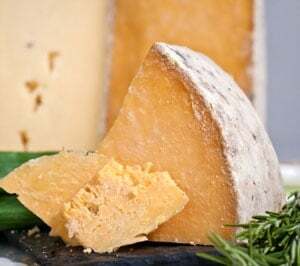 The name Ros translates to “Blondie,” an affectionate nickname given to Josep, but also referring to the straw hue cheese’s interior when mature. Ombra, unlike any other Spanish sheep’s milk cheese, is a four-month aged small format wheel showing a natural mottled gray rind. The small round wheels, roughly two pounds each, offer a firm snowy white paste. 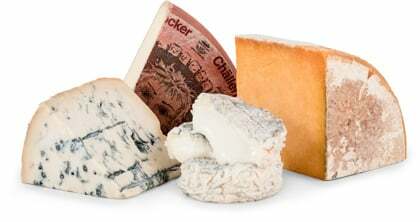 As the cheese ages, it becomes studded with crunchy nuggets of crystalized amino acids and turns a warm buttery color. As the cheese warms to room temperature, butterscotch and bright tropical pineapple notes emerge and lead into a lingering balanced citric and sweet finish. It reminds us a bit of a sheep’s milk Parmigiano, truly distinctive and unusual. Ombra is traditionally served with Rioja wine.